Here it is folks. Clock Numero Uno. At first glance: not running. Missing bluebird. Mainspring is wound but escapement isn’t moving. Wood with varnish. 4 short hanging chains, two of them with no ends. Paint faded or chipped (blues and greens especially). Research says this is a Pendulette clock from the Lux Clock Mfg Co. That would put it circa 1930s. Work done: opened it up, spring went flying (oops). Took all the gears out, did a cursory cleaning (need to get better at this), spent awhile trying to figure out how the gears go back together. Bought some supplies including mainspring clamps to make this easier on my hands. When those came in the mail I was able to use pliers (amazing), tweezers (amazing), and a spring clamp (beyond amazing) to put this dude back together. Of course it was a little backwards first but got it in the end. 8/4: it runs! It ticks! Pendulette swings!… Well a little too fast actually. Going to keep track of periods and times. Maybe I wound this guy too much last night. Going to take a few videos and watch in slow motion to count tickets per time. Plan: I’ll let it wound down and then see if, wound for a day or so, it keeps better time. 8/12 Well it wound down after a couple of days but now I can’t get it to continuously swing. I start it and a few moments later it stops. 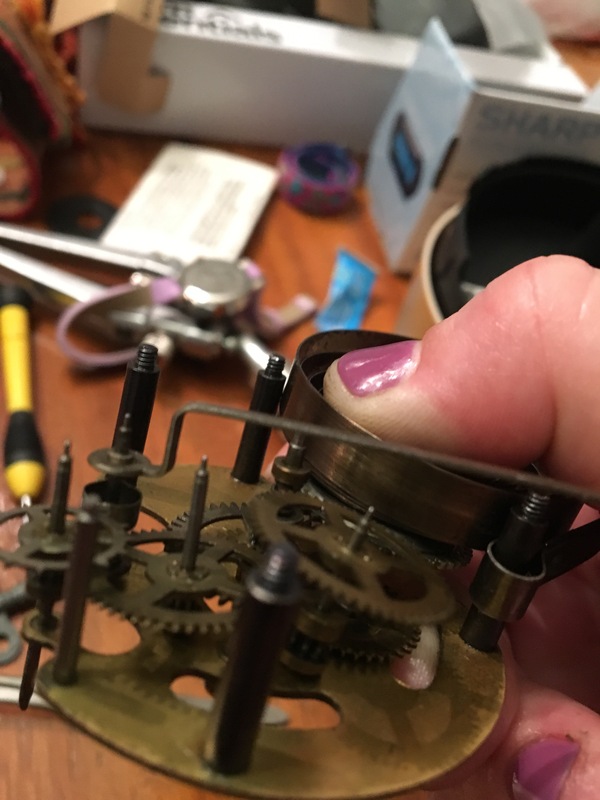 I added 2 washers to keep the hour hand from slipping out of line on the front of the mechanism (why are they separated like this? So weird). Could 2 be too many and there’s too much friction now? Maybe I should try just one. I had to use a dab of superglue to get the hour hand to stay back in place though… It was supposed to be solidly stuck on that front slipping gear but I had taken it off fairly easily. Next: try to remove one washer and try again. Look for areas that could be rubbing to stop the pendulum. 8/15 – Okay I bought a smaller key (size 1) and filed down the key turning thing until it was mostly square and now it is way easier to wind. But it’s not telling time! Something isn’t working inside. Have to take it apart again. Don’t know why, because it should be fine now. This is so cool! I have almost exactly the same model except my key hole is next to the 9. I have the original key (I got the clock as a present when I was little), but I’ve never been able to get it to wind for as long as I can remember. I put the key in and try to turn it clockwise but it won’t budge. Do you have any idea what might be going on now that you’ve opened this one up? Next Next post: Why Make a Blog?